$50k price reduction on this updated 75' Hatteras yacht for sale! : Atlantic Yacht & Ship, Inc.
Be sure not to miss this beautiful used 75′ Hatteras yacht that Chris Carroll has for sale in Florida! In the first place, this alluring used 75′ Hatteras yacht is known as “Coho”. After all, since she was launched in 2000 you will love the condition she is in. In fact, this Hatteras yacht for sale is by far the most well-equipped and upgraded 75 on the market today. Moreover, this very knowledgeable owner has taken steps to make sure this yacht stands out. After all, this owner has spent over $250,000 over the last year and a half. Therefore, this is the boat to buy if you are looking in the 70 – 80 foot range! This handsome used 75′ Hatteras has spent over half of her life in the Great Lakes. There she enjoyed five months of service every year in a heated storage shed. Furthermore, in 2010 over $150,000 was invested to update the boat. This included the hot tub and custom grill on the bridge. Additionally new soft goods (inside and out) 10 new flat screen TVs, and entertainment systems were installed. Captain maintained since day one, this yacht is in like-new condition. 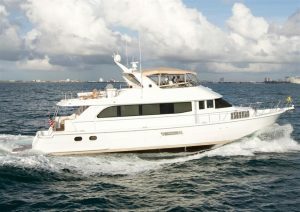 For more information on this lovely used 75′ Hatteras yacht for sale in Florida be sure to contact Chris Carroll today! For over 56 years Atlantic Yacht & Ship has been serving the yachting community. Our headquarter sales office is dockside at Harbour Towne Marina. In the heart of the yachting capital of the world, Fort Lauderdale, FL. Our in-house waterside service department provides general yacht services. This includes from new teak, to engine rebuilds, captain services, and everything in between. Whether purchasing or marketing a quality vessel, Atlantic Yacht & Ship, Inc. is your one stop resource. We provide the highest quality service and sales in the yachting industry today. Regardless if you are looking at yachts for sale, or thinking about selling your yacht. It is always wise to have an experienced broker representing your interests throughout the deal. Contact Atlantic Yacht & Ship at 954.921.1500 or click here.